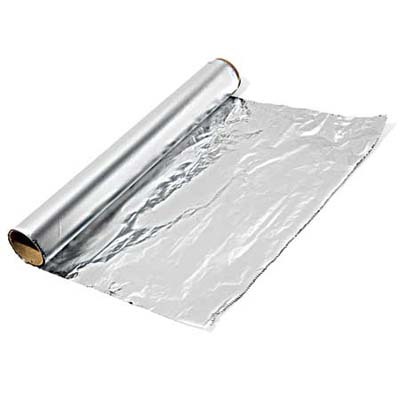 TIP: Solve remote problems with a little aluminum foil! Over and over again, we hear about people who have problems with their remote controls not working. It doesn’t matter if the batteries are changed, it doesn’t matter if they change remotes, nothing seems to solve the problem. These folks just need to point their remotes very carefully. If this applies to you, there’s a simple fix: aluminum foil. Many flat-panels made between 2004 and 2009 put off a lot of radio interference. This can cause a remote control to function poorly. Fluorescent lights can also be a culprit. If you think that this might be your problem, try this simple test. Turn off the TV and all lights in the room, but leave the “problem” box (satellite receiver, Blu-ray player, etc.) on. Try using the remote but don’t point it carefully. With many satellite receivers, you can see the lights flash when a remote command is received. If yours doesn’t do this, try issuing a command that will be obvious even if the TV is off, like turning the box off or ejecting a disc on a DVD player. If you find it’s easier to use the remote with everything off, try turning things back on to see where the problem is so you’ll know. Then, build a little “hood” of aluminum foil that isolates the remote sensor but doesn’t cover up any ventilation holes. Use a flashlight to see the remote sensor, it usually looks like a little hole behind the black plastic front. It may take a few layers of foil and a few tries but this simple tip can help your remote issues disappear! In the long term, you’ll probably want to replace the item that causes the problems… but for now this is a quick and inexpensive fix. 20 Tuners from a SWM-16! It can be done! NICE AND EASY: Can you charge your phone through the USB port on a DIRECTV box? Should you install a SWM-32?